Everyone wants to spend their month without any stress of breaking the budget. Have you ever calculated how many times we initiate the conversation over calls, SMS or social media?? Surely not! It’s not important to make this calculation but to keep the check on your mobile credit is necessary. As call service rates are high and sometimes it is hard for customers to recharge mobile credit again and again. So the perfect solution to this problem is the hybrid bundle. A hybrid bundle is what gives you all resources through a single offer and at low rates as well. Different telecom companies have introduced hybrid bundles to provide ease and convenience to their customers. Jazz gold monthly offer is giving you unlimited on-net & off-net minutes, all networks SMS and data Mbs for whole 30 days. You will get all these benefits at just 590 including tax per month. Call setup charges will apply. Want a complete package to meet your communication needs?? Jazz gold monthly offer is here for you with all services bundled in the single package. You will get following resources with the gold monthly offer. 1800 minutes to make calls to those friends who are in Jazz and Warid numbers. 180 minutes to stay in touch with your off-net friends as well. To enjoy your One-to-one conversation over texting the offer brings you 1800 SMS on all local networks. Get 1800 Mbs for the free access to the internet. 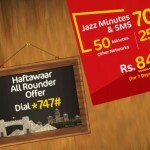 If you want to get all the fun in one offer then just activate the Jazz gold monthly offer now. You can subscribe the offer by dialing the code *707#. After subscribing, you will get confirmation messages of successful activation. Want to get the further information about the offer, you can dial *707*2# and to check the offer’s status you have to use the code *707*3#. The Jazz gold monthly offer will be deactivated at the midnight of the 30th day starting from the subscription day. Moreover, you can also deactivate the offer by dialing *707*4# from your Jazz connection. 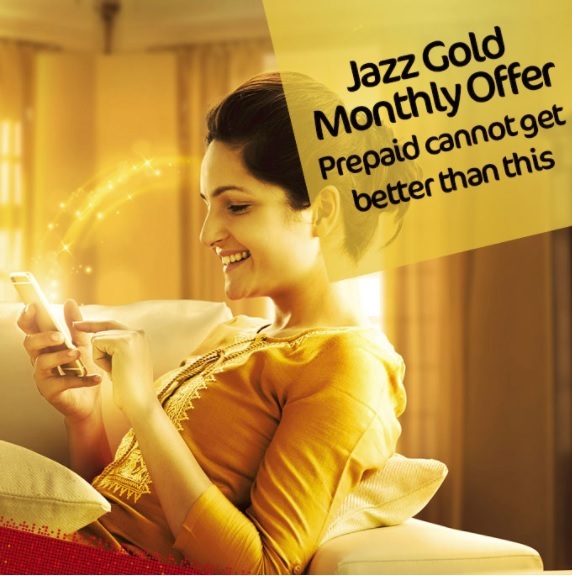 Jazz gold monthly offer’s activation is only allowed for Jazz prepaid subscribers. The offer’s incentive and charges can be changed anytime as per company rules and regulations. The offer is limited time offer. Incentives of the offer will remain effective for 30 days. There is no time exemption, you can avail the resources 24 hrs in a day. All incentives will expire on the 30th day of subscription whether consumed or not. The offer is not auto recursive; it will not renew, you will have to subscribe it again. Provided data Mbs is for both 2G and 3G users of Jazz. FED, operational fees and service charges will apply depending on the region you live in. Withholding tax will also apply to recharge and bill. Jazz gold Monthly offer is for those who want to get all in one offer by paying less. If you want your mobile conversation to be effective, don’t miss the chance and activate the monthly gold offer now!